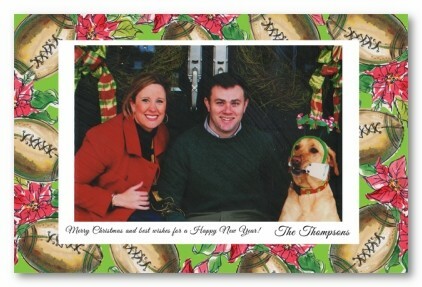 Send personalized Holiday greetings with a festive digital photo card that is sure to be a hit! Just add your favorite Christmas photo and sentiment to complete the look. Please upload a photo at least 4" x 6" at 300 dpi or larger. All photos are printed flat on premium, 100+ lb. stationery card stock, not glossy photo paper. Please enter your personalized text exactly as you would like it to appear. All orders are set up and proofed by a designer before shipping. For a monogram, enter your initials in the exact order as you want them to appear. No text will be assumed. You will have the option to purchase a proof for an additional $5 during check-out. Paid proofs are sent to your email address within 2 to 3 business days. Once proofs have been approved, orders will be shipped within 5-7 business days. If you have any concerns about your personalization before the proof is sent, please note it in the comment box below. NOTE: If you have any issues with personalizing your invitation in the previewer, please type your personalization in the comment box below and we will set your personalization up for you. Click HERE for tips and help on using our previewer. Copyright © 2018 [Address to Impress, LLC].